About a year ago, BYU published an article showing the Joseph Smith Translation (JST) of the Bible appears to rely on the Adam Clarke Bible Commentary. I first was made aware of this in a good podcast interview by Laura Hales at LDS Perspectives. In conducting new research into the origins of (Joseph) Smith’s Bible translation, we uncovered evidence that Smith and his associates used a readily available Bible commentary while compiling a new Bible translation, or more properly a revision of the King James Bible. The commentary, Adam Clarke’s famous Holy Bible, Containing the Old and New Testaments, was a mainstay for Methodist theologians and biblical scholars alike, and was one of the most widely available commentaries in the mid-1820s and 1830s in America. Direct borrowing from this source has not previously been connected to Smith’s translation efforts, and the fundamental question of what Smith meant by the term “translation” with respect to his efforts to rework the biblical text can now be reconsidered in light of this new evidence. What is noteworthy in detailing the usage of this source is that Adam Clarke’s textual emendations come through Smith’s translation as inspired changes to the text. As some of my readers have noticed, I’m a little obsessed with Book of Mormon origin analysis and discussions. It’s my opinion that the Book of Mormon is a 19th century work. I think it’s best understood as non-historical or as an extended metaphor. As a Latter-day Saint, I accept it as scripture and read it and study it to be inspired and learn the word of God. But the anachronisms and evidence as I understand it lead me to believe it should be treated the same way we view other inspired but non-historical scripture such as the New Testament parables, Job or Noah’s flood. I believe there are textual clues inside the Book of Mormon that with more analysis will lead us to be a better understanding of how it came together. Yes, it was translated by the power of God. But we still don’t know exactly what Joseph meant by the word translation. This research by Wilson and Wayment is a huge discovery in helping us understand what the JST translation process was like. I am wondering if a similar application towards the Book of Mormon would possibly bear interesting results. This is the path I would take if I undertook such a study. I would analyze the Book of Mormon “Sermon” portions. I divide the BOM into the “N voice” or narrative voice, which is the third person narrative of Mormon. And the “S Voice” or sermon voice, which is the first person voice of King Benjamin, Alma, Abinadi, Amulek, etc. Inside the S voice, I would look for snippets from the KJV, and then I would look in the Bible Commentary of those KJV verses to see the discussion. For example, 2 Nephi 9 would show hits in phrasing with 1 Corinthians 15. Then I would look in the Bible Commentary for 1 Cor 15 to see if I could find hits for BOM phrases like “behooveth great Creator” or “came by reason of transgression” for example. You might find a Bible commentary or other important religious work or sermon that references these together. I would look at the large blocks of Isaiah, Malachi, and Matthew and the differences between the BOM and the 1769 KJV and search the Bible Commentary for clues on those differences. 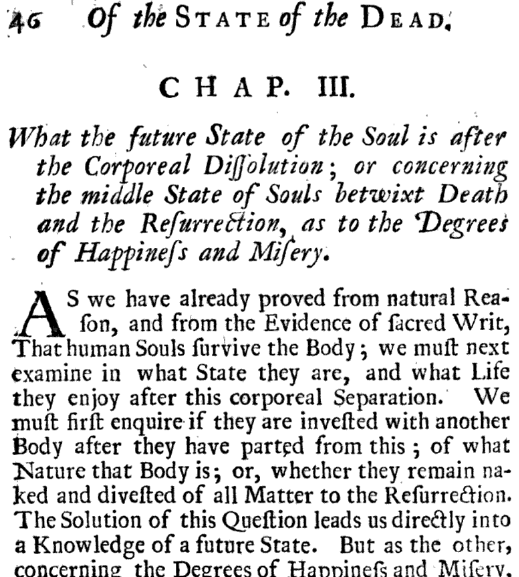 I would look at some of the specific matches like Alma 40’s match with Of the State of The Dead, And of Those that are to Rise: In Two Volums, Volume 1, Thomas Burnet, Matthias Earbery 1728. Maybe the particular Bible Commentary also included this unique text. I would look at the Bible Commentary for references to Hebrews 2: 17,18 to see if there was expanded text that was familiar at all to Alma 7:11-13. Mosiah 15 and 16 is Abinadi’s exegesis on Isaiah 53, the suffering servant. I would look at bible commentaries to see what the discussion of Isaiah 53 was and if it sounded anything like Mos 15 and 16. The Book of Mormon is brilliant in its simple, powerful, and inspiring exegesis of sometimes vague, short, or hard to understand Bible passages. I don’t think it’s outside the definition of translation to think Joseph could consult existing Bible commentaries of his day to help him translate the Book of Mormon text. That’s essentially what the restoration was. Taking the very best and most inspired of various faith traditions.